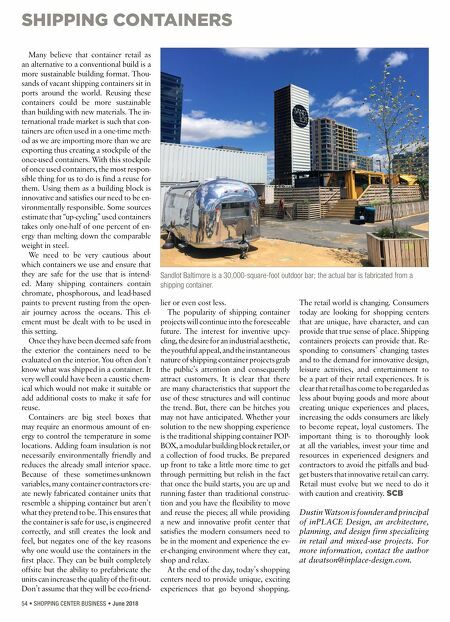 SHIPPING CONTAINERS 54 • SHOPPING CENTER BUSINESS • June 2018 Many believe that container retail as an alternative to a conventional build is a more sustainable building format. Thou- sands of vacant shipping containers sit in ports around the world. Reusing these containers could be more sustainable than building with new materials. The in- ternational trade market is such that con- tainers are often used in a one-time meth- od as we are importing more than we are exporting thus creating a stockpile of the once-used containers. With this stockpile of once used containers, the most respon- sible thing for us to do is find a reuse for them. Using them as a building block is innovative and satisfies our need to be en- vironmentally responsible. Some sources estimate that "up-cycling" used containers takes only one-half of one percent of en- ergy than melting down the comparable weight in steel. We need to be very cautious about which containers we use and ensure that they are safe for the use that is intend- ed. Many shipping containers contain chromate, phosphorous, and lead-based paints to prevent rusting from the open- air journey across the oceans. This el- ement must be dealt with to be used in this setting. Once they have been deemed safe from the exterior the containers need to be evaluated on the interior. You often don't know what was shipped in a container. It very well could have been a caustic chem- ical which would not make it suitable or add additional costs to make it safe for reuse. Containers are big steel boxes that may require an enormous amount of en- ergy to control the temperature in some locations. Adding foam insulation is not necessarily environmentally friendly and reduces the already small interior space. Because of these sometimes-unknown variables, many container contractors cre- ate newly fabricated container units that resemble a shipping container but aren't what they pretend to be. This ensures that the container is safe for use, is engineered correctly, and still creates the look and feel, but negates one of the key reasons why one would use the containers in the first place. They can be built completely offsite but the ability to prefabricate the units can increase the quality of the fit-out. Don't assume that they will be eco-friend- lier or even cost less. The popularity of shipping container projects will continue into the foreseeable future. The interest for inventive upcy- cling, the desire for an industrial aesthetic, the youthful appeal, and the instantaneous nature of shipping container projects grab the public's attention and consequently attract customers. It is clear that there are many characteristics that support the use of these structures and will continue the trend. But, there can be hitches you may not have anticipated. Whether your solution to the new shopping experience is the traditional shipping container POP- BOX, a modular building block retailer, or a collection of food trucks. Be prepared up front to take a little more time to get through permitting but relish in the fact that once the build starts, you are up and running faster than traditional construc- tion and you have the flexibility to move and reuse the pieces; all while providing a new and innovative profit center that satisfies the modern consumers need to be in the moment and experience the ev- er-changing environment where they eat, shop and relax. At the end of the day, today's shopping centers need to provide unique, exciting experiences that go beyond shopping. The retail world is changing. Consumers today are looking for shopping centers that are unique, have character, and can provide that true sense of place. Shipping containers projects can provide that. Re- sponding to consumers' changing tastes and to the demand for innovative design, leisure activities, and entertainment to be a part of their retail experiences. It is clear that retail has come to be regarded as less about buying goods and more about creating unique experiences and places, increasing the odds consumers are likely to become repeat, loyal customers. 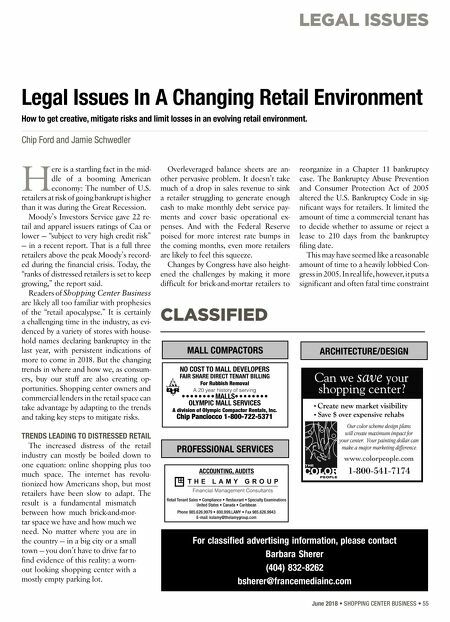 The important thing is to thoroughly look at all the variables, invest your time and resources in experienced designers and contractors to avoid the pitfalls and bud- get busters that innovative retail can carry. Retail must evolve but we need to do it with caution and creativity. SCB Dustin Watson is founder and principal of inPLACE Design, an architecture, planning, and design firm specializing in retail and mixed-use projects. For more information, contact the author at dwatson@inplace-design.com. Sandlot Baltimore is a 30,000-square-foot outdoor bar; the actual bar is fabricated from a shipping container.